A brief 2 minute video overview of my work. Clients over the years have been the best at putting into words what I am and do in my practice. At this time, the best and simplest explanation that I have heard from clients most frequently, is that I am a specialist in the mind-body connection and in releasing trauma. That’s the simple answer. When I try to put into words what I do, in the past it has always read too technical. This has improved over the years, and this below is the current version. It’s difficult sometimes to describe something ‘different’ in 30 minutes. Clients find it difficult to describe P.S.H. Therapy to their friends. And in that difficulty lies one of the major powerful principles of this work and the underlying foundation of all of my ongoing work, training and research over the last 27 years. The therapy work I practice in all it’s variations as required, all share a common factor…. THEY ARE ALL, BODY (NON-COGNITIVE CENTERED) AND BODY MINDFULNESS BASED. The most important work is done through sensations, feelings, movement – first, cognition and understanding – later. Which is why it is hard to explain it to friends. In most cases (with P.S.H. Therapy and BSP (Body Subconscious Process, especially) there are no words that accompany the process occurring. With the Body Psychotherapy work there are more words. But even there, clients find it hard afterwards to describe what happened and how. Working with the Body, Subconscious, ANS, all involves a PROCESS, not a gathering of FACTS. There is a PROCESS that needs to happen. One that (in many cases) became stuck in you a long time ago. So you can have all the facts consciously about why you are the way you are, but your body from your eyes down, may still be responding in the same old stuck pattern. I normally (in 80% of cases) like to start a client with P.S.H. Therapy or BSP (Body Subconscious Process Therapy). Mainly because it’s a very safe and private way of assisting the release of deep seated problems without having to go through any past traumas or personal history. It’s the simplest approach I’ve ever experienced. So I normally suggest this process first. Some people ring and know clearly that the Mindfulness Body Psychotherapy work is what they need, so there are no questions asked there. Also in cases where a problem or trauma is fresh (occurred recently) the Body Psychotherapy Trauma Event work is the best option. Once a person completes the three P.S.H. Therapy sessions, I allow four to eight weeks to see how things progress. If there are signs of improvement, then I suggest to leave things for twelve months and let the process continue, as we have found that things tends to continue to shift. A fourth session can be done some time in the following twelve months as the person feels fit. If there is no sign of improvement or too much is happening after four to eight weeks, the fourth session may be required or, the next stage – Mindfulness Body Psychotherapy. After the fourth session, we leave it another month to track progress. If there is still no change, then the Body Psychotherapy work is normally the next best thing. The Mindfulness Body Psychotherapy work is initially three sessions, maybe four, depending on how things are progressing. People normally have at least three sessions to gauge what they experience. Sessions are normally weekly. Other options are twice weekly, fortnightly, monthly. If after Mindfulness Body Psychotherapy, the problem shows no sign of shifting, we move on to the next stage – Radix Body Psychotherapy work. Radix is excellent for more stubborn blocks. It is a world class process for releasing emotional blocks. It is also excellent for specific traumas that may arise that are still active and incomplete, causing major symptoms. Click here to learn more about how trauma can affect your life. It may provide some answers you have been looking for. Once the therapeutic process has been established, people can return once a year for maintenance sessions (usually one to five sessions) to help clean out, re-balance and connect emotionally with their bodies again. Mindfulness Body Psychotherapy work (and Radix) are excellent for yearly tune-ups of our emotional and mental mind and body. I think it’s one of the ‘best kept secrets’ for many people. I highly suggest you don’t wait for a problem to be a problem before getting help. Make it a habit to have a series of sessions every year. You’ll be amazed what builds up that you don’t notice. And you feel the difference afterwards. Just like you can feel the difference after tuning up your car when you thought there wasn’t anything wrong beforehand. My Body Based work combines (Radix, Somatics, Hakomi Trauma(SPI), Ortho Bionomy, Voice Dialogue and elements of other trainings). I will use aspects of either of these methods together or separately when working. Another way of describing my work is to look at it as a five stage process. Not everyone needs all stages. Each stage is progressive depending on what the client requires. This diagram below may help to clarify. 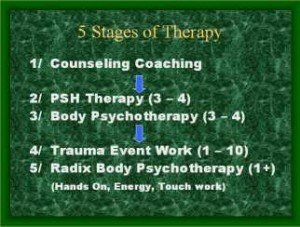 Stage 1 is your normal ‘talking’ Counselling/Coaching therapy approach. Most people that arrive at my door step have been down this road. It is the traditional first step in helping yourself with a problem. This is the analysis of a problem. Gaining understanding, talking and becoming aware of the patterns and beliefs that are running you. It is a cognitive method. The intellect rules. For some people this is enough. But for many people – they know their problems inside out, they also know how and when they first started AND IT HAS MADE LITTLE DIFFERENCE TO THEIR BEHAVIOURS! Why is this? The answer is simple. There are three brains in your head. Your intellect is only one third of your brain. There are another two major parts that run more of the show. It is these two lower based brain parts, that I have specialised in for the past 25 plus years. To learn more read my article on this in more detail or look at the Youtube video ‘Healing Your Subconscious‘ on my home page. Stage 2: As mentioned at the beginning of this page. I start most people with P.S.H. Therapy. There is a lot of information on this process on this site. This is a very gentle, safe and subtle approach, yet very powerful for most people. You close your eyes, relax back in the chair and say nothing – for all three sessions. It doesn’t get much simpler and safer than that. If I had to describe it, I would call it a ‘meditative therapy’. It should feel something like when you are meditating. Stage 3: If P.S.H. is too subtle, then we move onto the Mindfulness Body Psychotherapy stage. At this stage, you also close your eyes and you also sit back in the chair. The difference here is that I ask questions which you reply to as we go along. The questions are not normal analysis questions. The intellect doesn’t need to analyse anything. If you begin to analyse, then the two lower brains shut down and nothing really changes. So the questions I ask are tracking, process questions, designed for your two lower brains. (Also called the subconscious). At this stage we still do not dig up past memories, there is no need to. They surface naturally and gently if it is appropriate as the session progresses. This is a powerful process. A very special blend of some of the best ‘body based’ mindfulness processes in the world. (I teach this stage to practitioners in my three day ‘Working with The Body and the Energy Field’ Course.) Most people do not need to go much further after this stage. However some do. Stage 4: As an off-shoot of stage three, sometimes a powerful event may arise, and it becomes obvious that this has had a life changing effect on the person that is still not resolved. In such cases, I switch to Trauma Event work. Again there is more about this stage, on this site elsewhere, available to read. Or click here. Another off-shoot of stage three is my use of Energy Healing work. With this work you normally lie on a massage table (fully clothed) and just relax. (Sometimes it is done in the chair you are sitting in.) I work strongly with your bio-field and use my hands to work at the cellular energetic level. The session can be all ‘hands-off’ or include some ‘hands-on’ work, depending on the requirement. This work is most powerful and appropriate for medical problems that are not healing adequately enough by any other means, medical or non-medical. This includes, immune problems, nerve problems, growths, tumors etc. Stage 5: At this stage I introduce the physical, movement and ‘hands on’ work. Mainly Radix Body Psychotherapy. This work is the ultimate in depth and whole body based work. Your nervous system and two lower brains receive a complete work out. Nothing is left out. Because of this, this stage is left to last. Very few people are willing to jump in at this level. It can be too confronting. Even though it is safe and the practitioners that are trained to do this work are trained very thoroughly and professionally (so thoroughly that very few qualify each year around the world. To read the requirements click here.) At this stage there are no set session requirements, it is ongoing. People can have one session, two, three, ten, twenty, thirty etc, depending on the stubbornness of the problem. Sometimes people need to attend a Radix workshop in a small group of six to eight people (max) to really break through a stubborn problem. So each stage adds another element of your lower brains (and subconscious) functioning. And we progress as far as required to help release the deep seated subconscious holdings that cannot normally be shifted any other way.